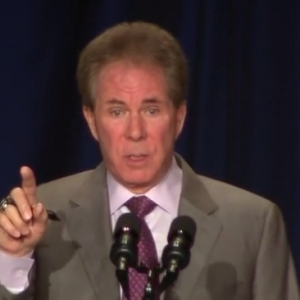 WASHINGTON — During Thursday’s National Prayer Breakfast in Washington, NASCAR great Darrell Waltrip shared his Christian testimony with the thousands gathered, including Barack and Michelle Obama and the Dalai Lama, stating that he thought he was once a pretty good person, but “good people” go to Hell without Christ. Waltrip, a NASCAR Hall of Fame recipient with 84 wins, spoke about the importance of coming to Christ and becoming a new creature before approximately 4,000 attendees, which hailed from 170 countries worldwide. He spent most of his talk sharing his story of how God changed his life from being a man that struggled with pride and alcoholism, to a person who now is humble and lives for Christ and not himself. He stated that his wife Stevie tried to get him to go to church, but he would tell her that he didn’t have the time. But a serious crash during the 1983 Daytona 500 became the turning point for Waltrip as he realized that he could have died that day—without Christ. After the incident, Waltrip began going to church, and the pastor, Cortez Cooper, began ministering to him on a personal level. Waltrip told his wife that night as they drove home that he felt like a “new man” and that he had been born again. The NASCAR champion and regular commentator on SPEED told the thousands listening that while it is hard for him to look back at the way he used to be, he is thankful for how Christ has changed his life.